OF GOTHIC CONSTRUCTION. IN every arch, whether a segment of a circle, an ellipsis, or in the pointed arches, called Gothic, there is a great lateral pressure. This constitutes the leading principle of construc- tion in Gothic architecture, which depends on its abuttals [see fig. 131, b]. 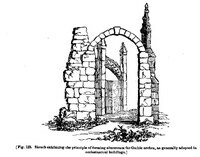 An arch may sometimes abut against a rock, as in bridges; or against a pier of masonry, as in castles, &c.; but, in light Gothic structures, the abuttals consist of buttresses to counteract the lateral pressure; and where such buttresses are not sufficiently heavy, additional weight is used under the various forms of pinnacles, or finials, which have often been mistaken for mere ornaments, of no use in the construction; and these are sometimes placed at a distance when they are connected by what are called flying buttresses, like those at Henry the Seventh's chapel [see fig. 133].